This cache is part of a series of caches reflecting Oconto County History. Please respect the delicate nature of the surroundings, being careful not to damage vegetation and items that may be of historical significance. Reports of such nature will result in the archiving of these caches. 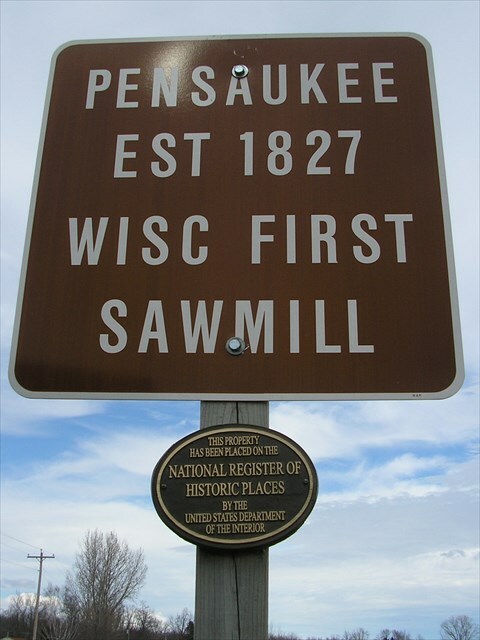 Wisconsin’s first documented and sustained commercial water powered sawmill and lumbering operation, Arndt’s Pensaukee Mill (1827), was built here on the Pensaukee River. The site is on the National Register of Historic Places. The mill was used until the 1860s. Pensaukee was Oconto County’s first modern era community with the first modern farm, both being established around the Mill. A dam levy along the north bank of the river can still be seen but is the only surviving structure. E.A. Taylor’s Pensaukee stagecoach stop (ca 1855) and hotel (ca 1871) and Gardner’s Sawmill and Grand Hotel (ca 1850 and 1872) were also located nearby. The Grand Hotel was advertised as the largest and most lavish north of Milwaukee. They were destroyed by a huge tornado which leveled much of Pensaukee in 1877. This is an easy two-part multi. The final can be found at a scenic spot on the Pensaukee River and is a camoed pill bottle. Bring a pencil. The Geocache Notification Form has been submitted to the Wisconsin DNR. Geocaches placed on Wisconsin DNR managed lands require permission by means of a notification form. The DNR Notification form and land manager information can be obtained at: http://www.wi-geocaching.com/hiding Permission to place the cache was granted by John Huff, DNR property manager, on 4/16/2013.